On this week’s very special episode of Saturday Night Shut-In Mr. Moderator reflects on his experiences with David Bowie’s lyrics. On this week’s episode of Saturday Night Shut-In Mr. Moderator reflects on an afternoon trip to a local record store. And related topics. This week, Mr. Moderator revisits records that made a deep, lasting impression on him from the first time he dropped the needle (or pushed PLAY or clicked a link). 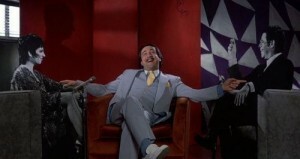 What records stuck with you and wove their way into particular moments in your life? This week, Mr. Moderator broadcasts (almost) live from London, England! Stay tuned for a killer track from Saccharine Trust, among other highlights. UPDATED: I’m bringing this post back to The Main Stage to celebrate the following blockbuster piece from The A.V. Club. Do the math! Filmmaker Chris Wilcha captured what it was like working at Columbia House during this boom time in a low-key, first-person documentary called The Target Shoots First. Wilcha—who started off in the marketing department as an assistant product manager and was soon promoted to product manager—took a camcorder to work and captured the absurdity and mundanity of the company at that moment in time. He filmed scenes not just in the company’s New York offices, but also at the massive Terre Haute, Indiana, manufacturing, customer service, and distribution center (which employed 3,300 people in 1996) as well as an amusing Aerosmith in-store appearance and a trade-show rendezvous with David Hasselhoff. 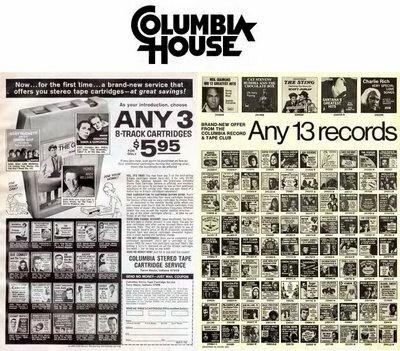 Can remember the first 12 records (or cassettes or 8-tracks) you received from Columbia House for just 1¢? If you’re from a younger generation, can you recall your introductory BMG order? If you’re from a younger generation yet and have no idea what I’m talking about, think of those first free downloads you received from eMusic, but without your parents getting mad at you for forgetting to send back the following month’s default “featured” lp and now owing money for the latest Barbara Streisand album, which you don’t want to be caught dead with owning. Speaking of those default selections that would get sent to your house each month, what’s the biggest turd you ever got stuck owning?